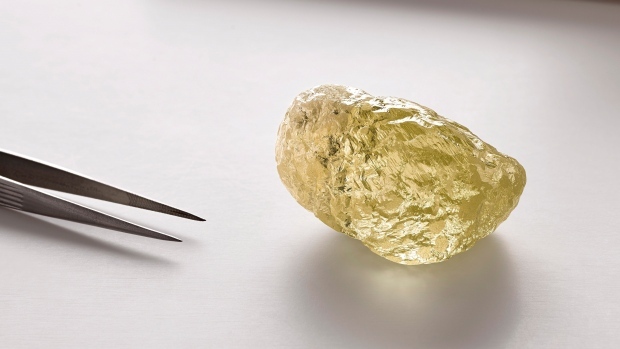 The 552-carat yellow gem was found at the Diavik mine in the Northwest Territories, and is almost three times the size of the next largest stone ever found in Canada. While Diavik and the neighbouring Ekati mine produce some very high quality diamonds, they’re not renowned for the sort of huge gems normally found in southern African mines. There have been a slew of big finds in recent years as better technology helped miners first detect, and then not break big stones that are susceptible to being smashed in the mining process. 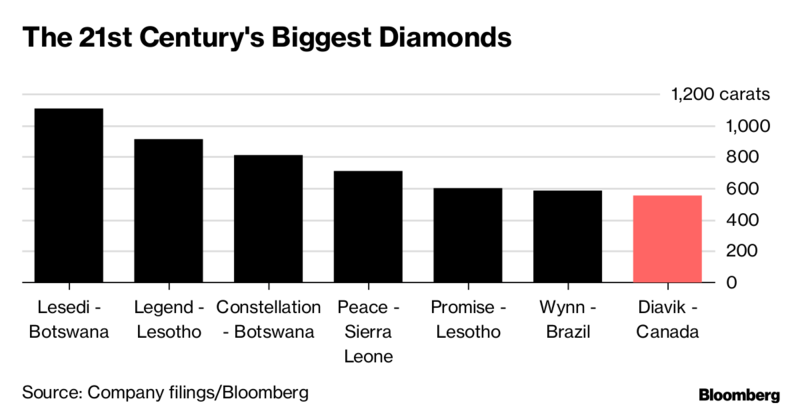 Among those are diamonds found by Lucara Diamond Corp. and Gem Diamonds Ltd. that fetched between US$40 million and US$63 million. In 2015, Rio unearthed a 187.7 carat gem-quality diamond from Diavik. ‘Foxfire’ narrowly escaped being pulverized because its elongated shape allowed it to slip sideways through a filtering screen. The diamond was exhibited at the Smithsonian before being turned into a pair of pale yellow earrings weighing a total of 77.7 carats. The earrings sold for over US$1.5 million at Christie’s earlier this month. This year’s find comes at a good time for Dominion. Since billionaire Dennis Washington bought the company for US$1.2 billion last year, there’s been a management merry-go-round with at least five senior personnel leaving. That includes CEO Patrick Evans, who left last week after just over a year at the helm. Dominion needs to decide if it will pull the trigger on expansion projects that would extend the life of the Ekati mine.